Q. Is it possible to sin in dreams? Do you think that dreams in any sense reflect one’s state of morality absent of inhibitions or consequences? Do you think that they serve as warnings in terms of what might be the consequences of various actions? Or are they just dreams and shouldn’t be paid much attention? Whether it’s possible to sin in a dream depends on what sense of sin is in view. The Bible envisions sin in two different senses. In one sense it’s conscious willful disobedience to the known wishes of God, or, put more simply, doing something that you know is wrong. This involves a choice of the will, and that’s why it’s not possible to sin in this sense in your dreams. We are not morally responsible for every idea that pops into our heads, every thought that flits through our minds, or every feeling or desire that wells up inside us. So dreams don’t really reflect what we would be like morally if we had no consequences to fear. What we are responsible for is what we choose to do with these things that come into our minds and show up in our dreams. It’s not a sin to become angry with someone, for example. (The Bible itself says, “Be angry, but do not sin.”) But it is a sin to choose to take a further step and hold a grudge, plot revenge, or lose our temper and become verbally or physically abusive. For example, suppose you have an argument with someone during the day. That night, you dream about killing them. This is not a sin. It’s the expression of a feeling. But when you wake up, you are morally responsible for what you choose to do in response to that feeling, which you have now become vividly aware of. Following the Bible’s teaching, you should seek forgiveness and reconciliation with that other person. In other words, what happens in dreams represents only the first stage in the process–an idea, or wish, or desire. Since our wills are not active in our dreams, but instead our unconscious mind paints a lively symbolic scenario based on an idea, wish, or desire, there is no moral culpability–no sin–on our part, no matter what happens in the dream. But as I said, there is another sense in which the Bible envisions sin. It’s also a force that’s active within us to shape our thoughts, words, and actions towards evil, in ways we are often not aware of. This force is active even in our dreams. The very things we imagine, desire, and wish for are not necessarily morally neutral, but influenced by the force of sin. And in that sense, while we still do not sin in our dreams, we dream while under the influence of sin, and so the way we put things together in our heads while dreaming, the way we organize the events and incidents of the day and week while we are asleep, may be “sinful” in the sense that it does not reflect God’s perfect balance of love and justice, but rather some skewed version of it that appeals to us in our sinful state. So while we still do not need to “repent” of anything that happens in our dreams in the sense of confessing guilt and asking forgiveness, we do need to “repent” in the literal sense of re-thinking the way we have put things together in a dream, critiquing that apparent resolution or aspiration in light of biblical teaching prayerfully under the guidance of the Holy Spirit, in the full light of day. 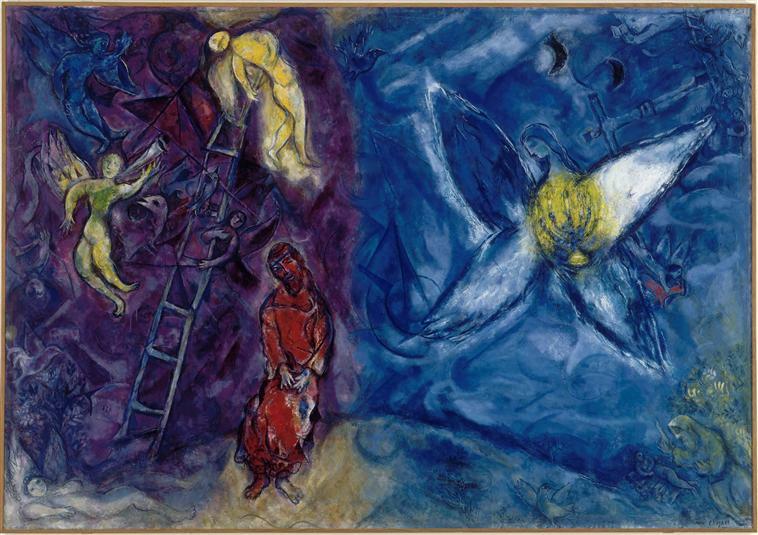 Marc Chagall, “Jacob’s Dream.” Jacob’s dream represented a recognition of the holy place he was in and of the God who had come to meet him there. I agree with you. Sometimes Satan will try to tempt us by for example if I blesemy the holy sprit he will make be the emperor. So in the dream you will be like littering to doing this terrible sin. Not to cherry pick scripture, but perhaps 2 Corinthians 10:5 gives a clue when suggesting we bring all thoughts into captivity in obedience to Christ. 2 Timothy 3:16 tells us all scripture is God breathed for purpose of teaching righteousness, right? So doesn’t this indicate we have the ability to bring ALL thoughts (including dreams) into captivity in obedience? Would this indicate we have the ability to control our thoughts and are therefore responsible to do so? There are a lot of body muscles I don’t use regularly enough to have the degree of control that others who do use those muscles have. Could this be another instance where if we exercise this area of control more, we become better at controlling our thoughts and dreams? Wouldn’t it be better to work on controlling our thoughts and dreams than to just say I have no control and continue to do this? What if this applied to conscious thought? At the first sinful thought, could we then simply state we have no control over our thoughts and just give into whatever sinful thought we’re having? If this were true, then why would Jesus warn us? See Mathew 5:28. Perhaps sometimes we are too quick to blame the devil or too quick to give ourselves a pass on things we think are outside our control. Isn’t it our responsibility to be transformed into the very image of Christ? I’m certain all sin is covered by the cross, but we must ask forgiveness and seek to change in order to be forgiven. We don’t have to be perfect, grace covers us, but we have to recognize sin, repent, and try to change. How can we change if we never recognize the sin? Perhaps this is the job of the Holy Spirit to bring to our attention the sin in our lives, but don’t we have to listen when the Spirit does this? I don’t claim to know this answer, these are just some thoughts of a fallen sinful man forgiven by God and trying to conform to the image of Christ. Perhaps some prayerful reflection is needed. Aren’t we all to work out our salvation with fear and trembling? As for me, I will be asking God for forgiveness for my dreams and working to control them. Not saying I have the ability to control my dreams, but I will try. However I know like conscious thought, once I recognize the thought / dream is wrong, then I can choose to no longer think it by simply praying a quick prayer asking God to forgive me and take this thought from me. For those who may disagree about being able to control thoughts, please read / remember Philippians 4:13, I can do ALL things through Christ who strengthens me. Hope this was helpful. God bless. Thank you for contributing to this discussion. The one thing I’d note in response is that dreams are highly symbolic, and things in dreams often don’t mean what they’d mean in real life. For example, someone once told me about a dream they’d had in which they cut out their own tongue. As we talked over the dream, they realized that the day before, they’d said something they really regretted. The dream was basically a way of expressing the wish that they’d never said it. The take-home from the dream would be to work on controlling the tongue. It would indeed be a sin if we actually cut out our own tongue. But I don’t believe that the person who dreamed this had any guilt or sin because of it, as it was a symbolic message. I think many dreams operate on this “wish I hadn’t”/”wish I had”/”wish I could” stage, and we’re not morally responsible for every wish that goes through our head, even when we’re awake. We’re reponsible for how we respond to those wishes and desires. And that is the stuff of conscious decision-making, when we’re awake. I think this is a good observation. I believe the Bible encourages us to have a tender conscience before God, so that if we believe anything is wrong, we should not do it, and if we believe we’ve done something wrong, we should ask forgiveness as you did. Paul says this, for example, in his discussion of eating food offered to idols. Some things may be acceptable for others but not for our consciences, and as you say, we must not harden our hearts in that case. Previous Previous post: Did Jesus and Paul have different focuses in their teaching–the kingdom of God vs. salvation by grace? Next Next post: Were Daniel and his friends eunuchs?